Top dressing can be a vital factor in making long-term improvements to the health and appearance of any lawn. Soil plays a major part in the development of a lawn. Thin, sandy soils (common in coastal areas like Porthcawl and Ogmore) and heavy clay soils (such as might be found in the northern parts of Cardiff) are not ideal for lawns, but top dressing can alter the nature of your top soil and significantly improve the growing conditions. The right mixture of top dressing will complement and gradually change the properties of your existing soil. If, for example, your garden lawn has heavy clay soil, a layer of sandy soil top dressing will stimulate grass growth, encourage greater rooting, and improve surface drainage. Top dressing is labour-intensive work, and sourcing the right kind of top dressing can be difficult and expensive once you factor in delivery costs. To cover 1 square metre of soil, you’ll need approximately 5kg of top dressing. Grass seed can also be added to thicken up the lawn. Top dressing is comparable to varnishing a boat: several layers have to be applied over a period of time. 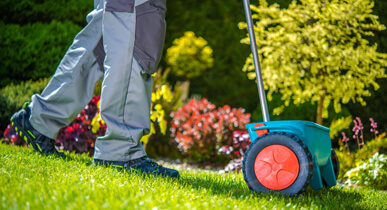 For help with top dressing, get in touch with Lawn & Weed expert today – this service is available in Cardiff, Newport, Swansea, and all over South Wales.